Rohingya Muslims who left their country as a result of persecution and massacres in Myanmar and refuge in the camps in Bangladesh Cox’s Bazaar felt festive and experienced joy by humanitarian organizations conducting the victim activities in the camps came to the region from Turkey – The Turkish charities and volunteers distributed sacrifices to tens of thousands of families in Cox’s Bazar, where more than 1 million Arakanese Muslims live. 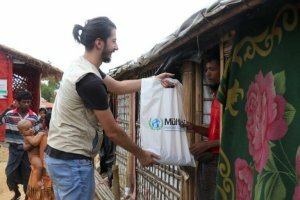 COX’S BAZAR (AA) – KAAN BOZDOĞAN – Rohingya Muslims who left their homeland because of attacks and massacres of Myanmar army took refuge in camps set up in the Bangladesh Cox’s Bazaar city, rejoiced holiday joy lived through aid organizations from Turkey. Arakan Rohingya Muslims, who have been subjected to oppression, violence, persecution and massacres by various groups for centuries, live a life far away from their homeland Myanmar. Arakan, founded in the 15th century, has become a minority in the motherland of Arakanese Muslims, with the collapse of the Islamic State, the political power of Burma Sultanate in the late 18th century and the British influence of the region in the 20th century with its colonial understanding. In this process, Arakan Muslims had to take shelter in the surrounding countries with the increase of violence and massacres in the country. In historical sources, 150 thousand people began in Çanbili in the town of Minbya, which began in 1942 and later in the massacres in Arakan, and 20,000 Arakanese Muslims were killed in the years 1962-1984 as part of the Burmese Socialist Party Program. Hundreds of thousands of Arakanese Muslims were forced to look at the surrounding countries, especially Bangladesh, as the size of the massacre increased day by day. In the report published by the United Nations, the persecution of Arakanese Muslims in Myanmar continued, and the Muslims here are taking shelter in the camps in Cox ‘s Bazar, Bangladesh. More than 1 million Rohingya Muslims who face genocide, settled in the camps in the Coxls Bazar of Bangladesh, surpassing the Naf River. refugees struggling to survive under harsh conditions in 27 camps in the city, while living in makeshift shelter, clothing and basic food supplies are met largely by aid organizations in Turkey. refugees pass their days in misery, they said they felt deeply the support of Turkey. Arakanese Muslims in the camps, celebrated the Feast of Sacrifice a day later in Turkey. Refugees who made prayer with their congregations at their mosques and prayed for the relatives they lost as a result of the massacre in their countries. After the prayer, Arakanli Muslims celebrated with each other and the Turkish volunteers who came to the region for the Feast of Sacrifice showed close attention. After Eid greetings with the Turkish delegation chatter Arakanese Muslims, they have voiced their prayers to Turkey. Arakanese Muslims supported the activities of the Turkish aid volunteers by going to the areas of sacrifice in their camps. Some of the children around the area also painted their faces, hence they were seen with various figures in their hands. Dozens of aid organizations which came to Cox’S Bazaar from Turkey made a sacrifice to work effectively in the camp. Volunteers who cut the victims according to Islamic conditions, put the broken meat into bags and brought them to tens of thousands of families. On the occasion of the Feast of refugees to their homes will be meat on the table, in his speech, “God bless donors in Turkey. Some countries are sending short-term assistance, but Turkey does not leave us alone. Turkey’s aid does not cut, we had full most of the time with the aid sent from Turkey. On this holiday, it is Turkey that give us a sense of the feast. thinking of the victims in donations from the Arakanese Muslim brothers, God bless Turkey and the Turkish people. “they said. Faruk Bilal Şener, Board Member of the Sadakataşı Association, which conducts sacrifice activities with the slogan in sacrifice gives life, told AA correspondent that they cut the sacrifices of the donors and delivered the meat to the Arakanese Muslims. Şener explained that, they came here by proxy and now they are depart from the camp with Arakanese muslims’ greetings to the Turkish people. “We brought the greetings of the Turkish people Arakanese Muslims here, where we’re taking our donors and greetings to Muslims in Turkey.” He said. Expressing his happiness to live the joy of the feast of Arakan Muslims who are struggling to survive in difficult conditions, Şener said, “They live in small little tins, bamboo, and linoleum. Finding people in Turkey in catering to their homes and a large table for them, and the joy of the occasion brings feature. important than anything else to be happy working here Arakanese Muslims in the minimum requirements they continue their lives with their donations of our volunteers come from Turkey.” He said. The International Refugee Rights Association Board Member Musa Aydın also stressed that more than 1 million refugees have fought in the 27 camps in Coxdans Bazar. “Do not forget the Arakanese Rohingya Muslims” Aydın called and thanks to donors, the volunteers and the partner organizations. (Orphan Foundation), we shared the social perpective against child abuse and chilren’s murder and solution offers with the public. We start hearing more often in the news media in the world and Turkey about the child abuse and juvenile delinquency shows that reach a serious problem. This process reveals the need to take quick and more effective measures. This process deepens the conscience and turns into a social reaction. 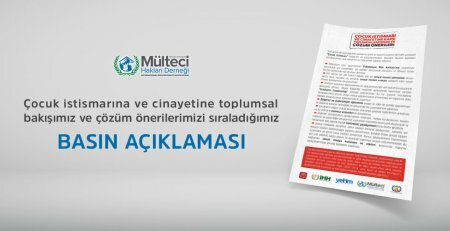 We have gathered together under the leadership of the Yetim Vakfı (Orphan Foundation) and shared our Social Perspective and Solutions for Child Abuse and Murder as a result of joint work with Humanitarian Relief Foundation(IHH) , International Doctors Association (AID), International Refugee Rights Association (UMHD) and International Social Service Platform. Hüsamettin Orhan, Vice Chairman of the Yetim Vakfı (Orphan Foundation) made the joint statement. Hüsamettin Orhan, who started his speech by wishing patience for the painful families and nation of our children who lost his life, underlined that preventive measures should be taken as soon as possible. cleared from terrorism in Syria. years and millions of Syrians left their countries and took refuge in neighbor countries. that they could not forget. to the region to give the Syrian children their rights. “Our hope is that this war will end soon. lasted 15 days last year. This year the festival also lasted 15 days. thousand children, and school-aged children’s yearly stationery needs are also met. thousand children&#39;s photos, but he did not take as many pictures of children laughing today. 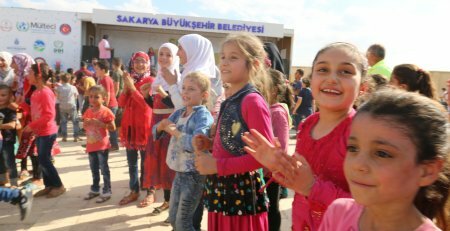 Region, in order to bring happiness to children Syria, continued today. created a row and wanted Turkish volunteers to paint their faces. and the Syrian revolution flag on the other side of their cheek. paint to show his love for Turkey who helped and support him and his family. 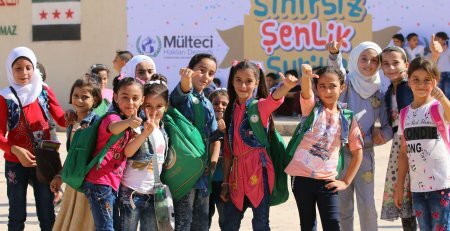 shows and competitions will be organized for Syrian children in the Euphrates Shield Region.